Within this able satire are clear-eyed depictions of politics when the cameras are turned off. 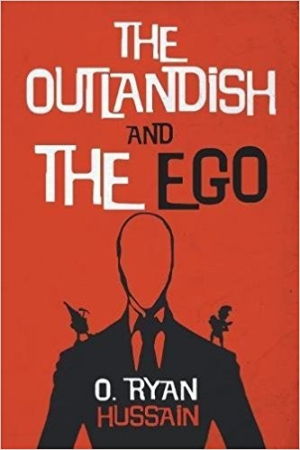 O. Ryan Hussain’s The Outlandish and the Ego is a political satire that wields broad, bawdy humor alongside quiet moments of tender human kindness. Two narratives run alongside each other, one operating on the vaulted heights of national politics and the other taking an intimate look at the outskirts of society, only converging to produce an explosive grand finale. Samuel is a man plagued by tiny dwarfs who live inside his brain—the agents (or are they the architects?) of a massive conspiracy that only he can see. Estranged from his family and desperate to remain out of psychiatric institutions, he lives on the streets with the only man he can trust: Roger, a committed Russian revolutionary (never mind that he was born in Indiana) who is convinced he can turn invisible. Together, they attempt to thwart the dwarfish conspiracy, fighting against spies and bombs that no one else notices. Far from Samuel and Roger, a true conspiracy is taking place, as the president’s advisers attempt to win their reelection bid through a ginned-up war and the stoking of racist sentiments among the American people, with the aid of a shadowy cabal who doesn’t accept failure. These two worlds are drawn together in a final showdown wherein conspiracy meets conspiracy. While entirely unique in its crafting, Hussain’s story invokes classics of twentieth-century social satire, including Catch-22 and Dr. Strangelove. It produces endearing characters alongside vicious caricatures that are uncomfortably familiar. Samuel and Roger, two men who are delusional but also warm and charming, are set against the nameless characters of the President, the Campaign Manager, and the Aide—crude, vile men who are avatars for politicians who hide their true ambitions behind well-crafted masks of electable personas. The political operatives’ racism, sexism, casual brutality, and willingness to humiliate even their supposed allies can be revolting, particularly when compared with the high-minded ideals of Samuel and Roger, and yet these moments remain readable because they come across not as attempts to sensationalize or exploit their subject matters, but as clear-eyed depictions of politics when the cameras are turned off. It would be easy to pin The Outlandish and the Ego within contemporary politics and to draw comparisons to the apparent rise of incivility among politicians today, but this feels like a disservice to the book. The Outlandish and the Ego makes it clear that these are not new trends—rather, they’re the current manifestations of an apparently timeless tradition. Within Hussain’s story is the uncomfortable reminder that conspiracies aren’t just the product of invisible dwarfs, they’re the product of backroom deals among privileged individuals who will stop at nothing to hold onto their positions of power—and they’re not going anywhere.